Inspired by Kwan Yin, Chinese expression of the Buddha of Compassion, Ven. 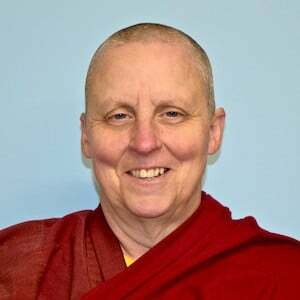 Thubten Tsultrim began to explore Buddhism in 2009. As she learned that “real people like me” aspired to become awakened like Kwan Yin, she began to investigate the possibility of becoming a monastic, which led her to Sravasti Abbey, where she first visited in May 2011. Ven. Tsultrim took refuge with Ven. Chodron at the Abbey in 2011 when she joined the Exploring Monastic Life program. This experience inspired her to remain at the Abbey where she continues to learn and grow in the Dharma. She took anagarika ordination in October of that year. On September 6, 2012 she received both the novice and training ordinations ( śrāmaṇerikā and śikṣamāṇā) and became Ven. Thubten Tsultrim (Venerable “Ethical Conduct of the Buddha’s Doctrine”). See her ordination photos. She took full ordination in Taiwan in 2015. See photos. Ven. Tsultrim was born in New England and spent 20 years in the United States Navy. She began her career doing maintenance on aircraft, then worked as an air traffic controller before retiring as a damage control chief petty officer. She has also worked as a staff member at a residential treatment center for teenage girls. At the Abbey she is responsible for maintaining the buildings, cooks and helps manage the kitchen, and provides support for the abundant audio teachings that the Abbey generates and shares.